Born: October 19, 1955, in Lubbock, Texas. Family: Married Arthur Holden (chairman, First Genetic Trust); children: two. Career: General Foods Corporation, 1982–1984, assistant product manager; Kraft Foods, 1984–1987, brand manager; 1987–1990, group brand manager; 1990–1993, vice president, new product development and strategy; 1991, vice president, marketing, dinners and enhancers; 1993–1995, president, Tombstone Pizza division; 1995–1997, executive vice president, Kraft Cheese division; 1997–1998, president, Kraft Cheese division; 1998–2000, executive vice president; 2000–2004, president and chief executive officer, Kraft Foods North America; 2001–2004, co–chief executive officer; 2004–, president, global marketing and category development. Awards: Laureate Award, National Cheese Institute, 2002; Alumni Association Award, Northwestern University School of Education and Social Policy, 2002. Address: Kraft Foods, Three Lakes Drive, Northfield, Illinois 60093; http://www.kraft.com. ■ In a career at Kraft Foods that lasted more than 20 years Betsy Holden worked her way through the ranks to become co-chief executive officer in 2001. Kraft Foods is the largest food company in the United States, encompassing major brands such as Kraft cheese, Jacobs and Maxwell House coffees, Oscar Mayer meats, Post cereals, Nabisco cookies and crackers, and Philadelphia cream cheese. Holden's role as a leader of the company was short-lived, and in 2004 she was named president of global marketing and category development while her former co-chief became the sole chief executive officer. Betsy Holden grew up in the small town of Washington, Pennsylvania, south of Pittsburgh. Her father was an obstetrician, and her mother a former accountant who stayed home to raise Holden and her two siblings. Holden attended public schools with the children of blue-collar workers. After graduation from college Holden worked as a teacher while pursuing her master's degree in education at Northwestern University. She then taught fourth grade for two years. While teaching, Holden created toys for children and had a part-time job helping the Playskool company develop toys and games. Although she found teaching fulfilling, Holden "was looking for something to combine the creative and the analytical," she told David Barboza, of the New York Times (May 28, 2000). Holden entered the master's degree program at Kellogg Graduate School of Management of Northwestern University. She excelled at Kellogg, where she was honored as valedictorian and the outstanding marketing student. Holden started her marketing career as an assistant product manager in the desserts division of General Foods Corporation, which later became a part of Kraft Foods. Holden moved to Kraft Foods as a brand manager, first in new products and then for the sandwich spread Miracle Whip. In 1987 she was named group brand manager of confections and snacks. In 1990 Holden became a vice president, first of new product development and strategy, and later of marketing, dinners and enhancers. The Wall Street Journal noted Holden's success in brand extension, or creating new versions of established products. In 1993 she became president of the Tombstone pizza division. While president of the pizza division, Holden made Tombstone a national brand and turned the DiGiorno pasta brand into a pizza franchise that brought in $400 million in annual sales by 2002. Holden presided over the DiGiorno roll-out, accompanying direct-delivery sales representatives on visits to stores and working on displays, product placement, and promotions. In 1995 she was named executive vice president and in 1997 president of the Kraft Cheese division. As head of the cheese division, Holden led the introduction of flavored Philadelphia cream cheese and calcium-fortified cheese. In 1998 Holden was named executive vice president of Kraft Foods. Holden was named president and chief executive officer of Kraft Foods North America in May 2000. While Holden was chief executive officer, sales of Oreo cookies increased sharply with the introduction of chocolate cream filling for the cookies. The title of co-chief executive officer of Kraft Foods was added in 2001, when Kraft Foods completed an initial public offering of stock. Holden continued to lead the larger North American division, which had an annual revenue of $21.9 billion in 2003. Her co-chief executive officer ran the smaller international division, which had a total revenue of $9.1 billion in 2003. Holden also was responsible for integrating the previously acquired Nabisco into Kraft Foods. In January 2004 Holden was assigned to the newly created post of president of global marketing and category development. Her demotion was a result of various problems at Kraft Foods, including slow sales growth, difficulties with product launches, and a failure to develop new products that private-label manufacturers could not copy. Holden had also raised product prices in response to higher prices of ingredients, causing market share to fall. A lowering of earnings estimates in 2003 led to a decline in the stock price. Many analysts, however, found the co-chief executive officer position to have been inherently unworkable and believed Holden was given too little time to make an impact at the company. Altria Group (formerly Philip Morris), which owned 84 percent of Kraft Foods stock, was seen as pushing for change to further plans to sell off more Kraft Foods stock. Holden remained with Kraft Foods despite the demotion because of her positive feelings for the company after a 23-year career there and her family's desire to remain near Chicago. As president of global marketing and category development, Holden was responsible for leading the company's worldwide growth agenda, global marketing resources, health and wellness nutritional initiatives, and new product development. Holden told the Chicago Sun-Times that writing a personal mission statement during a 1990 workshop at Kraft Foods was an important factor in her success. Participants in the exercise were instructed to imagine themselves at the end of their lives, looking back on what they had accomplished. Holden found the mission statement to be a guiding force in her life and used it annually to choose areas of focus. 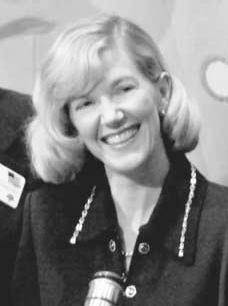 Kraft executives reflected that Holden's "teamwork, competitive drive, and inventiveness" led to her career accomplishments. Barboza noted that "Holden also had a knack for organization, even regimentation. She charted, listed, categorized and logically plotted not just her rise to power, but her family life" (May 28, 2000). An earlier chief executive officer of Kraft Foods described Holden as follows to Cheryl L. Reed of the Chicago Sun-Times : "She has a keen understanding of consumer insights…. She is smart. She is willing to take risks. She's an aggressive marketer" (April 12, 2004). Holden described her management style to Terry Stephan of Northwestern magazine as "positive, upbeat, enthusiastic … very collaborative, team-oriented." As one of the first woman executives with children at Kraft, Holden created a support network for working mothers. One of her stated goals was to help advance and mentor other women. Among her many civic and charitable activities, Holden served for years as president of the Off the Street Club, Chicago's oldest boys' and girls' club, leading the organization through a period of growth. See also entry on Kraft Foods Inc. in International Directory of Company Histories . Alexander, Delroy, "Deromedi Shuffles Kraft Execs: Holden Takes New Post as Head of Global Marketing," Chicago Tribune , January 9, 2004. Barboza, David, "Teacher, Cheerleader and C.E.O.," New York Times , May 28, 2000. Copple, Brandon, "Shelf-Determination," Forbes , April 15, 2002, p. 130–142. Ellison, Sarah, "Kraft's Stale Strategy: Endless Extensions of Oreos, Chips Ahoy and Jell-O Brands Created a New-Product Void," Wall Street Journal , December 18, 2003. Reed, Cheryl L., "Lined by DNA, Ambition, Career Jolts," Chicago Sun Times , April 12, 2004. Stephan, Terry, "Honing Her Kraft," Northwestern , Winter 2000, pp. 22–25.